Radius bending is one of the wide used application with the press brakes and as usual requires a lot of details. So we would like to speak more about it. Normally and the first the radius bending is the subject for consideration and precision calculation of possible springback. We already wrote it in other article so here we would like to ignore the main theory but one point still important - based on springback probably you need the tooling with the radius smaller than you want to obtain. This is very delicate question and can't be ignored but usually nobody has the perfect solution for it - we can't guarantee the real radius without tests and the customer can't understand how to achieve what he want. So mainly if the application is the first one in the customer workshop i.e. he doesn't have any practice for such bending - supply of tooling is the subject of compromises. We can supply tools for desired radius but if after bending because of springback he will get bigger value - it is his question to rebend. Next and more interesting point is the tool limitation. All the main producers today provide the solution with standard press brake tools for radius bending up to R50. There are different reasons why it goes this way - in practice it means that there are not so many orders for other and repeated radius types so to make stock of such tools if the wasting of money. Moreover to provide the good price nobody makes the one tool and to make ten when you by two of them - manufacturer has the problem to sell other eight. Other reasons are the connection with holders (tool should be not very heavy), possible tonnage etc. So we have the question - what is happen if you need to make R75. Or 95. Or 200. The bending theory of radius bending has 2 solutions. One means the full radius for one bend. And if you are making the standard radius, for example R25, there is no other solution, moreover it is the most economical one. There are differences - or you will buy the holder with radius insert or you will buy better and special solid radiused punch but anyway you will work with one stroke. Second solution called bumping and means the use of step bending to make one bigger radius with several smaller one. And there are also the different parameters, for example you can make R200 with punch R50 with 5 bends or 10 bends. To understand how many steps you need you should divide the complete length of the bend for several parts and probably make the tests according to the requirements how to obtain the smooth radius. Normally we would like to say that if customer requests the bend from R50 to R100 there could be the ideas and we can offer the special punch (but customer should understand that it costs more than standard) but if the request if to bend more than R100 - only bumping process is possible. This is not very hard in practice and the same work like a step bending but before running automatic programs the operator should find the optimal solutions. Radius bending is the question to the die choice as well. For example a lot of people like to use polyurethane dies specially for radius bending which also provides the mark free operation. We can't recommend soft materials in terms of repeatability because after number of bends the return of structural possibilities of soft material could be completely changed, meanwhile if you can accept this solution why not to use it. Normally big radiuses require big dies - according to the possibilities and also for reduction of forces. As we mentioned in springback article the choosing of angle of die also is important - more sharp angle could prevent for material return. Also with big opening dies the customer need to think about the question of handling - the weight is very big so the operator should be able to have the access for lifting devices to remove and install dies on the machine. 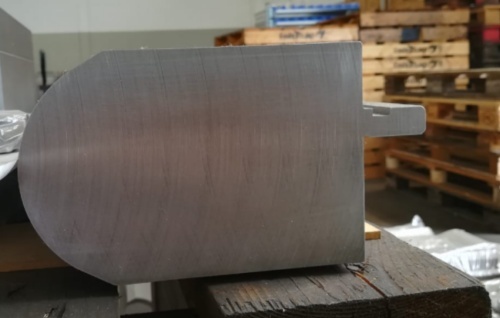 The radius bending of big thickness material makes additional requests to the construction of tooling - if it is made as support and insert - it should be quite important that the connection side is very rigid to prevent any displacement because of high forces. For this reasons even for medium thickness materials we are offering nitrided version of radius inserts - the forces could make the wear of insert very fast and any protection should be helpful.